Someone else will probably hear this album and absolutely love it. I am not that person though as this album just leaves me cold and uninterested. ‘Bitter’ never moves me and just starts to feel like a monotonous exercise with each song every time that I play it. Giving each song a one-word title seems a little silly and ultimately unimaginative to me. Some of that may also be my own subjectivity as I am just not personally getting any kind of depth from these songs. I anticipate something rather special if you are going to do a two minute or more intro to start an album, but this one just seems a little tedious in length and doesn’t add any enjoyment or dynamics to the first song ‘Breathing.’ A chugga chugga groove follows that never connects with me with the band applying a melodic chorus over the top of it. Unfortunately, the song also feels like it is dragging while it is playing due to its length. ‘Cross’ begins with an assembly line sound effect and down tuned guitar. The simple beat and gruff vocalsare a miss for me, but I do think this is one of the better attempts at a chorus with a hook. Corroded spend the first third of the record not hitting the right spots, which has made the album as a whole drag with each of these listens. ‘Burn’ finds my mind wandering each time as it feels a little monotonous. The acoustic passage that leads back into the electric solo is one of the better moments here, but the payoff is not worth sitting through the first half of the song. ‘Black’ begins with an isolated guitar intro and is rather slow moving. Whenever, I listen to the chorus though it reminds me of when the kids are watching two different shows at the same time. The vocals and backing vocals here just don’t work together in my head. ‘Testament’ features a better riff over a straight ahead metal beat. I think a stronger vocal might grab me here, and I like this chorus better than the other songs on the album. The band veer towards thrash with ‘Scream,’ but the song never really does anything special for me, and the chorus is rather lackluster. Jens Westin has a nice vocal on the verses in ‘Cyanide,’ but the song feels rather average to me. I do like the dynamics they were going for here though. ‘Destruction’ feels like modern metal by numbers but perhaps has the best groove on the album when it gets its chances. Hopefully, the band will explore some more of this going forward. The guitar work by Tomas Andersson and Westin provides something different in the beginning of ‘Time,’ but the vocals just drag the song down for me. ‘Drown’ again just feels like a chugga chugga beat by the numbers with no clear identity to be found. ‘War’ concludes the album, and each time I am just glad the album has drawn to a close. 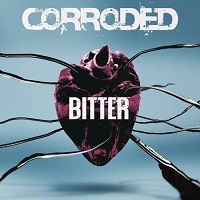 Not the album for me by a long shot, Corroded are clearly connecting with others though as this is their fifth release. They are not seeking to reinvent modern metal but likely appeal to diehard fans of the genre. If that is your thing, give this album a listen and see if it works for you. ‘Bitter’ is available now. You can get your copy HERE.